The annual Orange & Blue Debut drew a crowd of 53,000, the fourth-highest spring game attendance in school history, as the Blue team defeated the Orange team 13-10, for the fourth time in five years. The game previewed the 2011 football team and also showcased the new coaching staff under head coach Will Muschamp. Redshirt freshman quarterback Tyler Murphy went 7-for-11 for 68 yards with a long of 22 yards to lead all passers. Leading the Gators in receiving was Robert Clark who made two catches for 48 yards. Eight Gator receivers also had double digit receiving yards. Sophomore running back Malcolm Jones led the Gators in rushing with 13 carries for 68 yards (splitting time with both teams). Four running backs finished with over 30 yards. Senior kicker Caleb Sturgis split the uprights with a 21-yard field goal to put the Orange team on the board first in the second quarter, 3-0. The field goal capped off an eight-play, 20-yard drive. The Blue team quickly answered with a 44-yard drive that led to a 43-yard field goal by Sturgis to tie the game at 3-3. On the following drive, the Orange team’s progress was halted when Murphy’s pass was intercepted by sophomore cornerback Cody Riggs. The drive would close the half with a tied score of 3-3. To open the third quarter, freshman quarterback Jeff Driskel led the Blue team down the field setting up a 33-yard field goal by Sturgis to put the Blue team back in the lead, 6-3. Murphy connected on a 10-yard pass to sophomore running back Ben Sams for the game’s first touchdown and put the Orange team up, 10-6. With 45 seconds left on the clock, sophomore quarterback Christian Provancha threw a 39-yard touchdown pass to sophomore wide receiver Robert Clark. The seven-play, 72-yard drive was the longest drive of the game and put the Blue team in the lead, with sophomore kicker Brad Phillips tacking on the extra point to make the final score 13-10. Despite losing the game, the Orange team broke the Spring Game record for highest third down conversion percentage, going 5-of-8 (.625) on third down attempts. 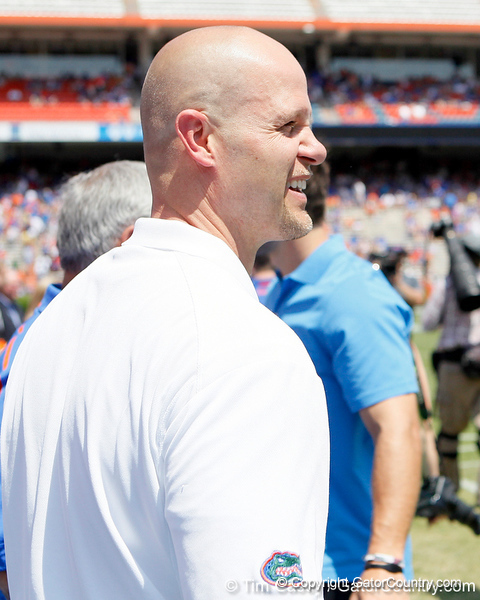 The Gators will make their 2011 regular-season debut on Sept. 3 against Florida Atlantic at Ben Hill Griffin Stadium.